Those of you who are ongoing readers of our blog may remember NSDL.org - the National Science Digital Library. I believe I stumbled upon a nice companion site to it. It's called Interactivate (part of Shodor.org) and includes activities (online practice) and lessons (a series of well-defined and understandable chunks that do seem to be a complete lesson). 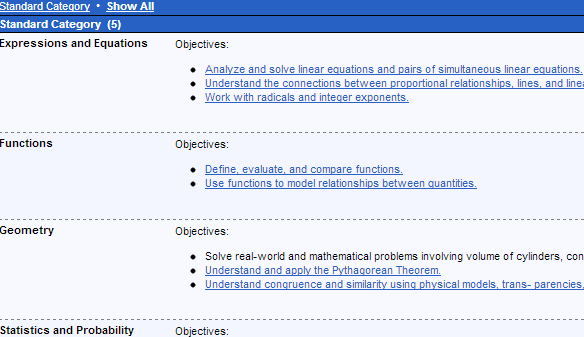 This page will help you find activities and lessons based upon Common Core, other state standards and NCTM as well. I had to fumble a bit (finally using the Site Map) to find this page; once there, I found a good selection of activities and lessons. 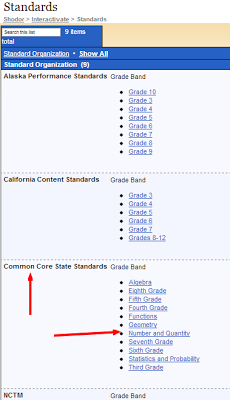 Access the grade you want within the standard of your choice. Then select the standard and see the lessons and activities. Some of the standards are not supported by any lessons and activities; the vast majority are, however. There is a lot more to the Shodor.org site, but this is what I focused on today. You may want to spend more time looking over the rest of the site- there is both a student and educator section worth checking in to. This site appears to be affiliated with NSDL and provides a subset of the vast resources of NSDL. Not being overwhelmed by choices may be a good thing - what do you think? We'd love to know your thoughts! CC Connection: CC-aligned math activities for students and lessons for teachers - that's it! Thanks Bob - that's great news! We'll help get the word out on this soon. the law of thermodynamics is perfect and suits here. for business issues it is true. i am thankful to you for such a lovely post here.This is a good lesson to remember .